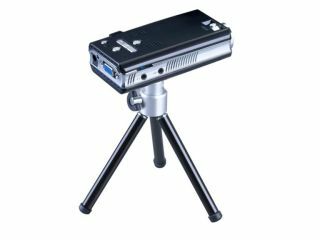 The new Adapt 305 pico projector has been launched in the UK, being touted as the 'world's brightest pico projector'. At 45 lumens, it certainly is bright, considering that other pico projectors thus far have been paddling around 11-20 lumens. It also packs a direct VGA link to laptops, so you can easily take a presentation with you wherever you go. There's also 4GB of onboard storage should you want to ditch the laptop altogether. If you're into hot-swapping, then a microSD slot will also let you add your own content to the device, meaning you can turn any tent into a pseudo drive-in experience. Adapt is claiming that the 305 can project 100-inch images from a distance of under four metres, but we're pretty sure you'll struggle to see much of that in normal light. However, push things a little closer to a wall (or your mate's back) and you'll be able to present or show movies or whatever you fancy - complete with tinny sound thanks to dual 0.5W speakers on the projector. It's not cheap at £303 (exc VAT), but if you're interested in tiny lights and portable images, you may be in luck.